Within business, there is a natural tendency for organizations to gravitate towards operational silos in which teams share information, resources, tools and techniques to achieve their common objectives. Enterprise IT organizations are no exception. Yet silos can inhibit cross-functional synergies, leading to inefficiencies, higher costs and unacceptable delays for detecting and repairing problems. Enterprise IT staff typically specialize in network operations (NetOps), security operations (SecOps) and IT operations (ITOps). DevOps is a new specialization that integrates rapid application development and operational deployment in small teams that deploy new software continuously. In most IT organizations, each team uses its own set of tools tailored for the specific needs of its operational silo. This also applies to the data that feeds these tools. Network managers use tools that ingest SNMP data, flow metadata and packet capture traces. Security teams sift through log data files and watch dashboards for various security appliances. IT operators monitor web servers, application resources, backend databases and storage subsystems. This mode of operation is perfectly acceptable, provided that there are few interdependencies between silos and when issues arise they can be quickly resolved through well-defined processes for exchanging information between teams. However, the migration of applications and services to the cloud — SaaS, hybrid multi-cloud, SD-WANs, IoT — is breaking this model. The heavy reliance on public network and application infrastructure makes it tricky to cleanly partition operational teams into silos. When something goes wrong, it won’t necessarily be easy to tell if a problem is due to network performance degradation, a poorly coded DevOps application or a failure within the cloud application infrastructure. The new generation of NetOps, SecOps, ITOps and DevOps tools will need to be more tightly integrated to facilitate cross-functional teamwork. Each team will rely on its own set of tools, but well-defined APIs will allow data to be shared between teams so that events can be rapidly correlated across operational stacks. For example, what at first glance might appear to be an infrastructure failure or performance anomaly could turn out to be a DDoS attack, with each set of tools interpreting the impact differently. By integrating multiple stacks to share data, operators can more quickly determine the actual root cause and proceed to mitigate the attack. 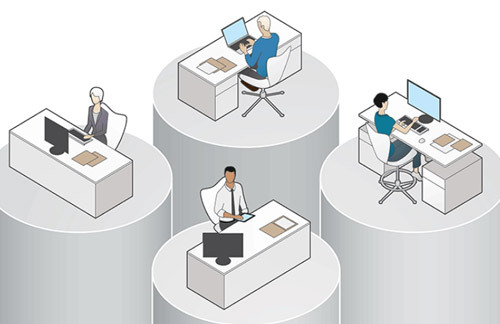 Breaking down operational silos involves redesigning business processes and then selecting the right tools and creating the supporting software stacks to implement those processes. Certainly not a transition that will take place overnight, but one that IT managers should start planning for now as the first step in moving from silos to synergy.